Moving along on my quest to read ALL of the Rick Riordan books, I've now started on the Kane Chronicles series, which begins with The Red Pyramid! To be honest, I didn't really know what to expect when going into this new series. I've only ever read the Percy Jackson and Heroes of Olympus series' by Rick so far, and I LOVE those books so much, I was worried about how I would get along with this new series. Luckily for me, I worried for nothing. While these books are completely different than the previous series I have read, they were still familiar in a way as well, and I ended up really enjoying the book! With a new series comes new characters, and I liked this new set of characters a lot more than I expected to! Carter and Sadie are brother and sister, and you can definitely tell they are related as you turn the pages. Even though they weren't raised together, and didn't spend much time together, they have a bond that I kind of love, and I enjoyed watching it grow over the course of the book. I'm excited to continue along the journey through the next two books with these characters. I really got into the storyline for the book as well. While the previous books dealt with Greek mythology, this book was all about Egypt mythology, which I know very little about. It was interesting, though! And some things I actually had heard of before, so that was nice. I'm super curious to continue along with series so I can learn more, and find out what's going to happen next for Sadie, Carter, and the rest of their crew. 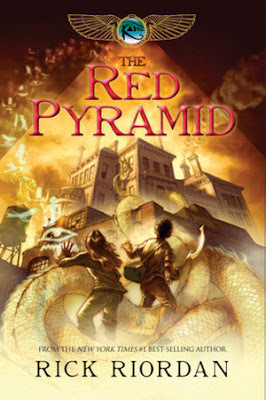 Overall; The Red Pyramid was an interesting start to this new (to me) book series, and I'm super curious to move along with the rest of the books as well. I am hoping to read both The Throne of Fire and The Serpent's Shadow as quickly as possible, and so that I can move on to the Magnus Chase and the Gods of Asgard and The Trials of Apollo series in 2018!